The NTU Libraries Research Data Management Guide is now up and running! The guide can be accessed via the Library homepage within the box titled “Research and Scholarship” or you can simply click the following URL to view the guide: https://blogs.ntu.edu.sg/lib-datamanagement/. 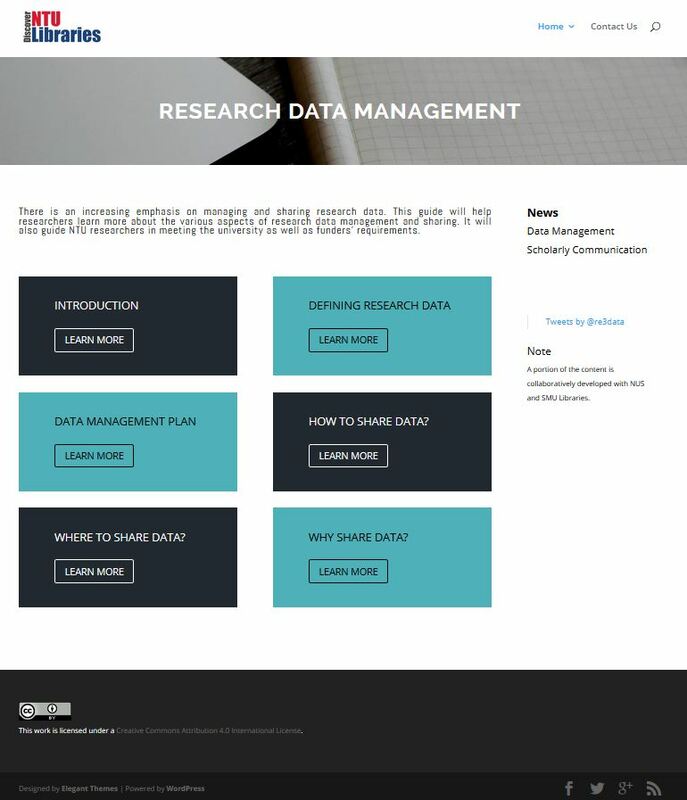 The research data management guide aims to help NTU researchers learn more about the various aspects of research data management and sharing as well as to guide them in meeting the university and funders’ requirements. Topics include what is research data, how to share data, where to share data, why share data, benefits of sharing data and etc. A number of relevant YouTube videos have also been included in the guide so that anyone who is interested in the topic could have a brief overview quickly. More topics will be made available in future updates of this guide, e.g. 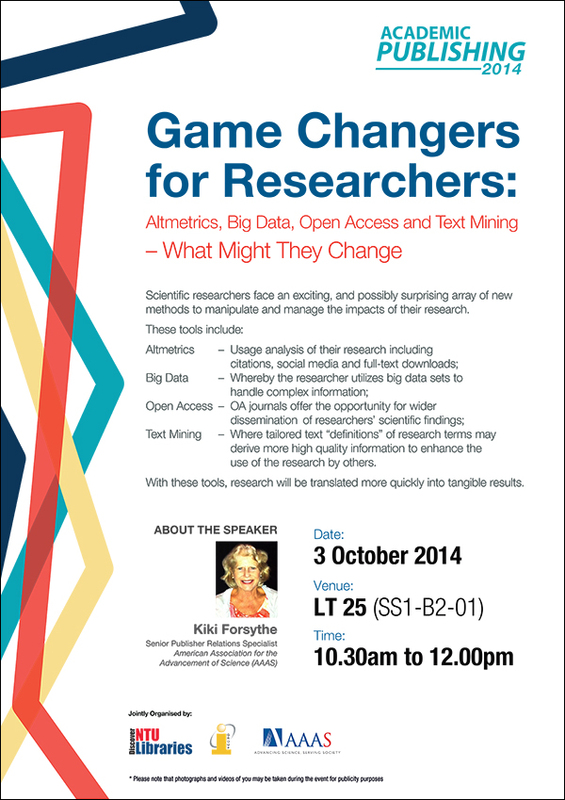 more local topics such as the upcoming NTU DMP, relevance to the NTU Research Data Policy, etc. Please stay tuned to the guide for more updates! If you would like to find out more about NTU Libraries research data management services, please contact us via ScholarlyComm@ntu.edu.sg. We are experimenting with new ways to provide services to our users. In addition to phone, walk-in and email, you may now contact us via WhatsApp! You may WhatsApp a Librarian if you need quick help on library services and resources. You need to install WhatsApp on your mobile phone and connect it to mobile or WIFI network. Sending messages via WhatsApp is free but you may incur personal mobile phone subscription charges. If you have feedback or enquiries, please email askalibrarian@ntu.edu.sg. After benefiting from the contributions of your seniors, it’s now your turn to leave behind your legacy. Submit your final approved FYP reports and accompanying materials to NTU’s Digital Repository (DR-NTU). If you have print publications, please arrange for a copy to be donated to the Library. Thank you! Final approved reports are those that have been reworked after your oral presentation and approved by your supervisor. Accompanying materials refer to works such as videos, publications, or other collaterals. If you’ve any questions on archiving FYPs, please speak to a Library staff. Proteins are integral to our daily lives – from food to materials that make up our body – without which we cannot function. For proteins to perform, they have to be properly folded, that is the arrangement in space has to be precise. What would happen if they are not? Can they be fixed? This talk will give an overview on how proteins are made in a cell, the problems that arise when they are not folded properly, what can be done to prevent or treat such conditions, and how we expand protein functions beyond the natural ones. Attend the talk by Kiki Forsythe of American Association for the Advancement of Science (AAAS). Text Mining – where tailored text “definitions” of research terms may derive more high quality information to enhance the use of the research by others. With these tools, research will be translated more quickly into tangible results. Kiki Forsythe, M.L.S., is the Senior Publisher Relations Specialist for the American Association for the Advancement of Science. She has worked for the Office of Publishing and Member Services in AAAS for 10 years. She holds cumulative publishing experience of 40 years. She has worked with International Thompson, University of Hawaii Press, Academic Press/Elsevier, Smithson Books, and AAAS. Her specialization with AAAS is working with the newest peer-reviewed AAAS journals, Science Signaling and Science Translational Medicine, launching the journals and collaborating with librarians and AAAS representatives worldwide. For more details, you can refer to Work Study Scheme. Mark your calendars to head down to any of our 10 (yes, 10!) Academic Publishing 2014 talks to get insights in publishing and how to make yourself stand out in the academic world! Click on the calendar below to find out more or to register for the talks. How authors can locate the accepted versions of their works on the author gateway. There is also a tea reception after the event.